Google integrate voice free phone call feature in Gmail mail application service, through which users can dial free telephone calls over the Web. Introducing voice calling feature enters Google search Giant engine into competition with the free internet telephony companies like Skype. Skype internet Phone service is the top most telephonic service with 560 million registered users with almost 8.1 million paying customers. Skype is known as the giant in the field of internet telephonic service as Google is known as Search giant. It’s really interesting that” Google Beating Skype”, see how Google internet telephone Voice service will do it. Every one knew it very well that when Google comes after anything, Google gets it. Apparently, Google has the advantage over Skype internet telephone service, by offering free internet calls to the users of U.S.A and Canada, and also offering very low cost calls to other countries users. Skype has the mobile version application as well google voice calls mobile application yet not available. 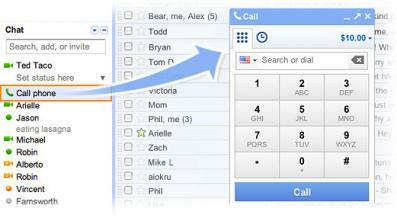 Google offers free voice call features through Gmail, enhance the Gmail products integrated with the Gmail mail application. Google is also introducing red color Google Voice calling booths at different locations like schools and airport places in order to catch the Non-Gmail users. Well, hopefully Gmail Voice calling feature will be able to beat Skype internet telephony service with all these features, especially free calls via Gmail offered by Google to its users. Skype now available for all Android devices, Wi-Fi only in U.S.